The Preschool Journeys program is 75 minutes and takes 3-through-6-year-olds on a journey through the museum. They'll explore a gallery, participate in interactive story time, and engage in hands-on STEAM activities. After exploring The Art of the Brick, the world’s largest exhibition of LEGO® art, students will be inspired to take part in hands-on projects. They will not only become engineers with blocks, but also artists and scientists as they create their own STEAM-based project. Imaginations will run wild in Cardboard Engineering—an experience dedicated to hands-on exploration and creation. Students will be inspired by engineering, art, and objects throughout the experience as well as a story time. Children learn and remember best when they participate in hands-on activities. On Nov. 1, STEAM Day promises to be one of these remember-worthy experiences! 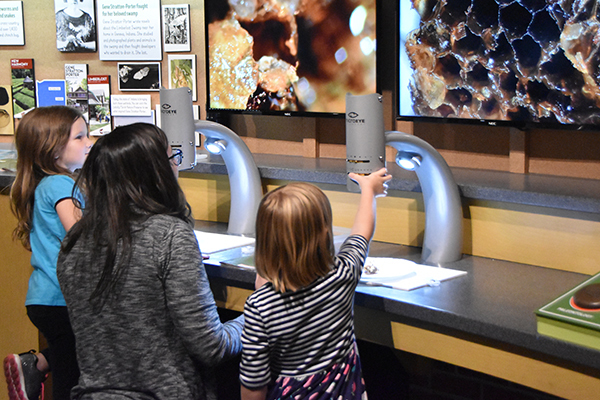 Children will interact with 8-10 activities spread throughout all three floors of the museum to tinker with and discover Indiana’s connections to science, technology, engineering, art and math. Bring your musical group to participate in a spectacular holiday atmosphere in the museum’s Great Hall. Holiday Sounds gives students the chance to perform in a public space between Dec. 2 and 16. Exercise your students’ communication and listening skills in this month's Educator Activity. Students will partner together, one as the designer and the other as the builder. See if they are able to communicate effectively and recreate the original design! Two new experiences opened this weekend. This means (other than the fact that you need to come enjoy them for yourself! ), new field trip options! Bring your students to see more than 80 original pieces of LEGO art made by artist Nathan Sawaya in THE ART OF THE BRICK, then, they can try building their own brick masterpiece. In Cardboard Engineering, they'll engage their creative sides to design and construct their own cardboard creations. Another opportunity to bring your class in is for Indiana Statehood Day. On Dec. 11 from 10 a.m. to 1 p.m., join the Indiana State Museum in a celebration of Indiana's 201st birthday. Hear a short presentation by Indiana's leaders, including an Indiana supreme court judge, and listen to the winner of the statehood day essay contest read his or her essay about "Why I am proud to be from Indiana." Support the Indiana State Museum and Historic Sites with a tax-deductible gift!